This past weekend was San Japan 8. I attended Saturday, August 1st, also known as 801 Day to my fellow fujoshi/fudanshi. One thing I should mention is that all the things I complained about from last year’s San Japan were fixed. Pre-registration line was non-existent much to my pleasant surprise. Took less than a minute to get my badge and start exploring the convention layout. Plenty of resting areas away from the main crowd. Some awesome convention attendee discounts at local venues (food and shopping). Public parking lots. Pay system was all electronic and expensive compared to last year. I parked on the North side of the Alamo and paid for 8Hr. I only had one panel get cancelled due to a no-show panelist, but it was okay since I was choosing between that one and another one that started 30 minutes later. Sadly, I didn’t make it to the Artist Alley(AA)/Dealer Room(DR). The line to get in when I tried were a little on the long side. My options were either skip lunch or not queuing up early enough for the next panel. My stomach and interest in the panels out weighed the AA/DR. What shall I explain next? Panels! So in total I attended 3 panels. Initially I had wanted to stay till about 7PM, but due to not having enough cash for parking I left around 5 PM. The panelists were 3 male cosplayers/friends from the website/blog: The Healthy Otaku. All 3 of the gentlemen work in the Information Technology (IT) field, like myself. Their presentation simply explained basic fitness from aerobic (cardio) to anaerobic (strength building) exercises with or without weights and healthy eating tips. Note: This is nothing new to me with my gymnastics and dance background, but it’s nice to see more and more of these types of panels. Panelists were 2 members from Southern Cospitality, a cosplay group in Texas. Most of the panel was dedicated to costume detail work using spandex and the techniques. In the last part, they explained resin: different types, tricks, tips, and safety tips. Was highly entertaining and informative. Presented by Lauren Moore (Social Media Coordinator) and Tara (Conventions Manager). First items presented were the recent anime home video releases: One Piece S7 Voyage 1, BEN-TO Complete Series Boxed Set, Hyperdimension Neptunia Limited/Standard Complete Series Boxed Set, Puchim@s Season 1 & 2 (Subbed) Boxed Sets, and Noragami Season 1 Boxed Set to just name a few. Next, a clip of all the Summer Simulcasts were shown along with the explanation of where all the simulcasts are streaming. Next, we got a sneak peek at current art for some upcoming Limited Collector’s Editions of Fullmetal Alchemist, Black Lagoon, and Tokyo Ghoul. Last thing presented was the license acquisitions of animated feature films including: Dragonball Z Resurrection F, The Boy and the Beast, Project Itoh (Genocidal Organ, Harmony, and The Empire of Corpes), and PSYCHO-PASS the Movie. Note: I’m definitely looking forward to the Fullmetal Alchemist and Tokyo Ghoul‘s Collector’s Editions and for all the feature films. All in all I had a blast this year!! Can’t wait to next year. Wishing y’all a beautiful week!! P.S. I forgot to mention this. 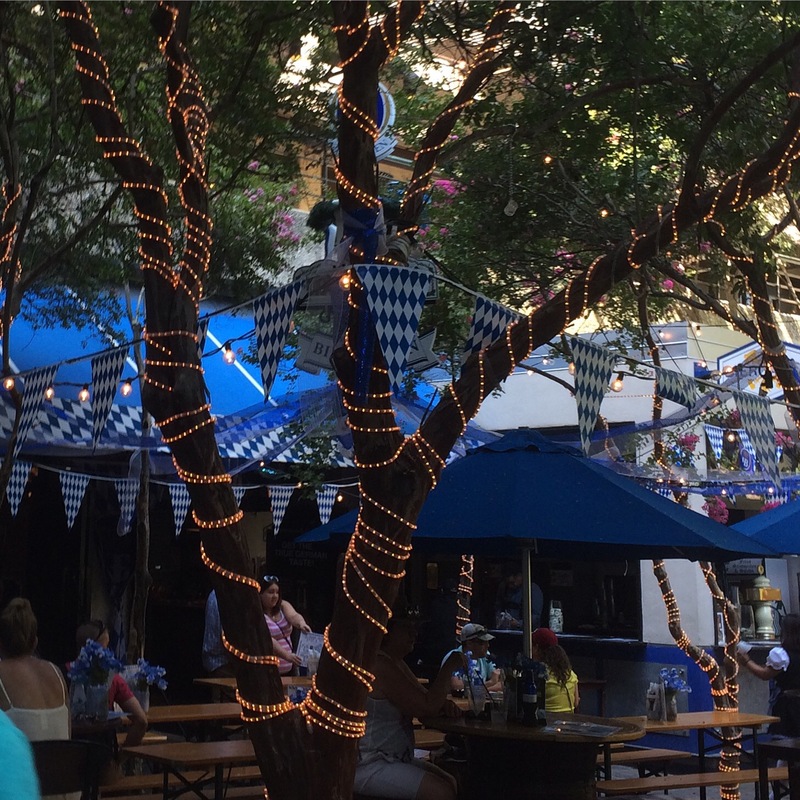 On my walk to the convention in the morning, I noticed an area marked “Biergarten” on the way to the Riverwalk through the Hilton. I’m half German, so I wondered: “Hmm… If it’s still open when I leave I’ll snap a pic.” It was still open and… OMGoodness! It was set up just like a typical Biergarten in Bayern with Bratwurst, Pommes, Hofbräuhaus Bier and photo ops area: King/Queen or Lederhosen Man/Woman. It was nicely nostalgic!! Too bad that I didn’t have time to stop and eat a Bratwurst.